There are many small cities near Madrid that are worth visiting, besides Toledo, another one you can look at is Segovia. It is just about an hour drive from Madrid. After our designer outlets shopping in Las Rozas Village, the next stop is Segovia city. 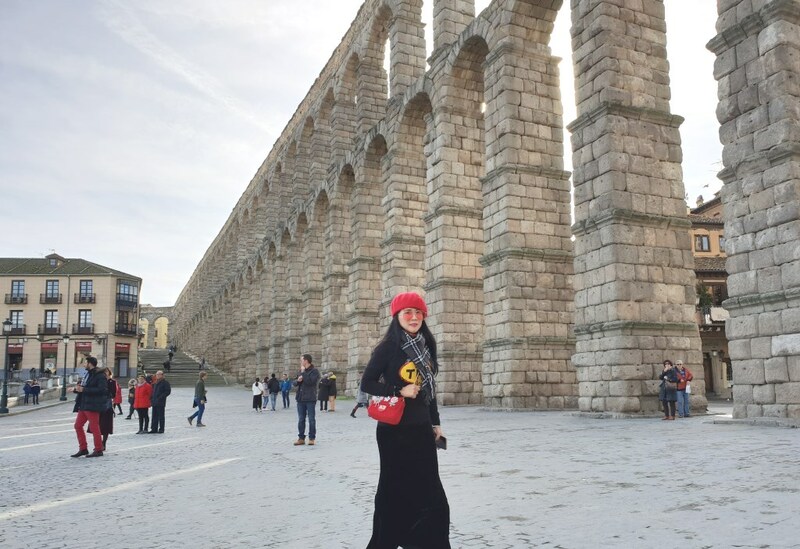 This city attracts hundreds of thousands of visitors every year to check out the grand Aqueduct tower which is majestically above the streets and monuments of Segovia. In ancient time, the Roman built an aqueduct to bring water into the cities and towns from outside sources such as river or streams. The aqueduct help brings in fresh water for everyday use such as drinking and bathing from as far as 50 to 60 miles away, it also helps to bring wastewater to farms for irrigation. The Roman engineers who designed them used gravity to do most of the work. (Gravity helps to move water) They also have to build tunnels to get water through mountains, and bridges to cross the valley. Wherever the Romans went they built aqueducts and you can still see an aqueduct in other former Roman colonies cities such as Bulgaria, Croatia, France, Greece, Isreal, Lebanon, Tunisia, Germany, and Spain. The Segovia aqueduct that we see in Segovia city only stop in use about 100 years ago. It carries water 16 km from the Frio River to the city of Segovia. It was built under the Roman emperor Trajan (reigned 98-117 ce). Yes, this aqueduct is the symbol of the city of Segovia and it is a Unesco World Heritage Site too. Some shops and restaurants & cafe near the Aqueduct. When you explore the city of Segovia, do check out the architecture of the buildings. You will see some of the Moorish influence too. The Moors are the north African (darker skin) Islamic people who came at around 711 and conquered Spain for 800 years. Huge Roman Numerals can be seen above the information center signboard. I am not sure why 1931 was there, probably the building was built in 1931. Segovia’s best-known dish – the roast suckling pig is a must try dish while in Segovia. We had that in a restaurant 5 mins walk from the Aqueduct. I have to tell you this is the die for dish and one of the best dishes I had in Spain. Sculpture of the wolf and the twin of Romulus and Remus is located in Segovia city before you reach the aqueduct. The wolf and twin sculpture refer to the Roman legend. It is believed that the twin was rescued by the wolf. The wolf fed the twin with her milk. When they grew up, Romulus and Remus took back their grandfather’s kingdom and established a city. The legend ends with Romulus killing his brother, and that’s how the history of Rome begun. There are two things that are famous in Segovia city. The magnificent Roman aqueduct which lines across the city and the roasted suckling pig called “cochinillo”. If you are exploring Madrid and want to visit the nearby cities, Segovia is a great location for a day trip. Wow, amazing structures. I didn’t know that there was Roman influences in Spain! Roman conquest and provinces in Hispania, beginning with Catalonia in 220 BC, and ending with Green Spain in 19 BC. You are able to see plenty of Roman ruins in Spain and Aqueduct Segovia is one of them, over 2000 years old. Pretty amazing as it is still standing grand till today. These are all so beautiful! It is amazing to me that they were able to create things like this! The Roman invent a lot of stuff, underfloor heating, concrete and the calendar that our modern calendar is based on. One of the important construction is the aqueducts that included arches and uses gravity to help transport spring water from the mountain to the city to use for fountain, common bath and household usesage. You can still find other Roman aqueducts in some European countries beside Spain, Segovia. Segovia is only an hour drive from Madrid and can be done within a day. Highly recommended if you want to explore the small cities around Madrid. Another one you may want to visit is Toledo city, the whole city is Unesco site and untouched, also the ancient capital for Spain. Thank you for such an interesting post! Your photos are amazing! Thanks for your comment. Segovia Aqueduct is pretty amazing to see in real. Beside the aqueduct, there are other attractions such as the Jewish quarter, the Disney look alike castle – Alcazar that you may want to visit too in this city. Thank you so much for these interesting trivia about Segovia. This sounds like a very interesting place to visit. Beside the Aqueduct in Segovia there are plenty of things you may like about this city, such as the look alike Disney castle – Alcázar de Segovia also another Unseco site in Segovia. Disney get the inspriation when he travel Europe and model Cinderella’s Castle in Walt Disney World (just like Alcazar De Segovia). The history is amazing and it’s awesone to think that engineering was so advanced in that time. I totally agree with you that the Roman are so good in their engineering and that was before 2000 years ago. I wonder how they built such complicated system? I would love to go to Spain. There is so much history there. I love the buildings pictured in this blog. The Segovia Aqueduct is beautiful. I hope to visit one day! Spain is such a great place to visit, the palaces, the impressive monuments, magnificient churches, the delicious tapas and their superb wine. The good news is the price is very affordable and cheap. This does look like it would be so cool to be able to see. I am always amazed by structures like this that have stood the test of time. You are totally right about it, the aqueduct is in use until hundred years ago. It helps to bring in fresh water from the mountain to the city. What a brilliant work. This is really a huge amazing engineering work. I got jealous of you. I would like to go there and take many photos too. Haha, thanks for your comment. The aqueduct of Segovia certainly is a huge one, it was built of some 24,000 dark-coloured Guadarrama granite blocks without the use of mortar. (728 metres) long and consists of some 165 arches more than 9 metres high. Pretty amazing right? If you see it in front of you, you will be speechless. Im hearing for the first time about segovia and the aqueduct! All your pictures are so beautiful ! Same as you, before visiting Spain, I have no idea what an aqueduct is for. Now I learnt so much about this incredible engineering marvel. Oh, yeah. I think that’s quite an engineering feat. Indeed a sight to behold. I totally agree. Another thing not to be missed when you visit Segovia is their roast suckling pig. Anyone who travel there should go try it out. A little pricey compared to other tapas but it certainly worth a try.